May Day traditions celebrate summer with sweets, treats and flowers. A fabulous tradition to start with your kids is making, filling and delivering surprise May Day baskets to unsuspecting friends. This easy Mason jar May Day basket is a fun craft and the beginning of a sweet tradition together! May Day is summer's best-kept secret. It's a lovely holiday centered around the season's sweetest offerings: flowers, sweets and friendship. 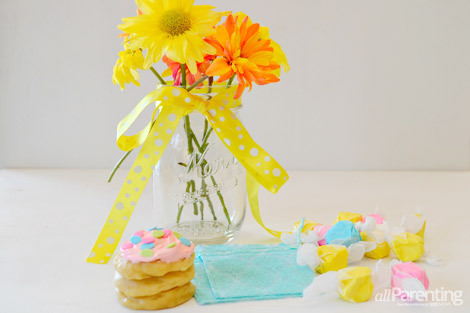 Today, May Day celebrates the onset of summer with surprise gifts in sweet containers. But the real magic and fun of May Day is that the gifts are meant to be left on doorsteps! 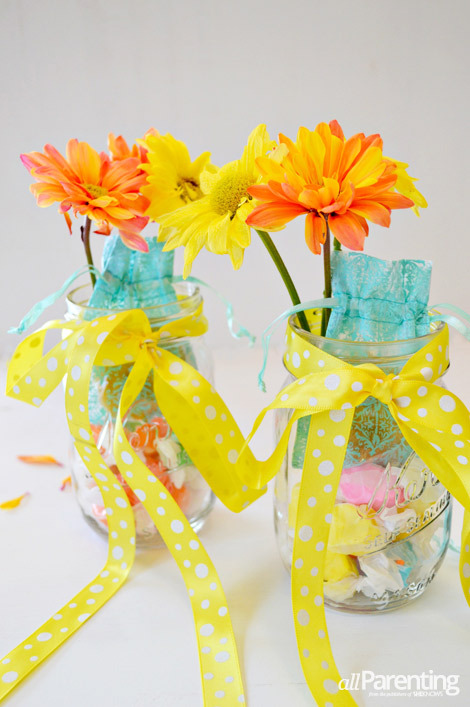 Start a new tradition with your little ones this year by making, filling and delivering these simple Mason jar May Day baskets. Being kind and sneaky together — ringing doorbells and running away before you're seen — might be both of your favorite parts of this sweet way to spend time together! Plan who you'd like to give May Day baskets to this year, and buy enough containers for each family. We love Mason jars because containers that can be easily reused make us swoon! What we love about this May Day basket is that your little one can fill it herself. Simply fill and tie a pretty bow around one together as an example, then lay out the supplies and let her help fill the containers. While you're filling the jars, discuss how you'll deliver them — place the jar on the doorstep, ring the doorbell and run away! To avoid tears, consider reminding your little one that if they happen to be seen, it's okay and is part of the fun. And last, think about bringing your camera along to capture your sneaky gift giving! 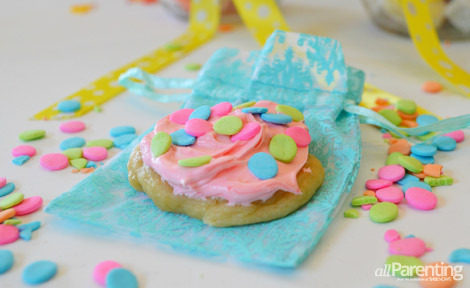 One more thought^ A lovely basket filler is homemade cookies wrapped in small organza bags or treat bags. And our soft sugar cookie recipe happens to be perfection. It comes together easily enough for your favorite helper to bake with you, and the result is delectable. In fact, as far as we can tell, this cookie's only downfall is that it disappears quickly! Combine the sour cream, sugar, butter, eggs and vanilla extract. Using an electric mixer, mix the ingredients as you add them, then mix them for an additional 2 minutes. Add the dry ingredients, mixing well after each addition. Cover and chill the dough in the refrigerator for 30 minutes. For shaped cookies, roll the dough 1/4-inch thick then use your favorite cookie cutters. Rolling the dough into small balls will make soft, round cookies. The dough will be sticky, but try adding flour only as needed. The less flour you use, the softer your cookie will be. Bake the cookies in a 350-degree oven for 8-10 minutes. When you take them out, they should be a light golden color and may seem underdone. Just let them cool on the pan, then frost. sprinkle and enjoy!